The mayor took the class to a town hall meeting about a widely contested issue for the downtown Little Rock community. The two Little Rock campuses are leveraging their location in a capital city region to grow the Master of Public Administration (MPA) program. "This is a relatively small program in the Webster portfolio, but it’s meeting a need in our market,” said Kelly Lyon, area director for the Little Rock campus locations. In the process, students last term received an inside look into the issues affecting redevelopment in downtown Little Rock. Little Rock's mayor, Mark Stodola, who returned to the Webster faculty in 2012 and developed an issues course in urban redevelopment. The program is housed at the Little Rock Air Force Base campus location, but the urban redevelopment class was offered in the Fall 2 term as an elective at the metro campus. This took advantage of the proximity to downtown and Main Street’s redevelopment and generated more visibility for Webster's MPA program. 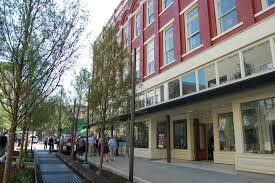 Highlights of the class included a walking tour of the Creative Corridor, which is a $100 million low-impact development project to improve downtown Little Rock’s Main Street. Improvements include rain gardens, bio retention basins, public art, friendly streetscapes, and a tree-lined boardwalk on the west side of the street. low-impact development of Little Rock's Main Street. “Sustainable practices such as permeable pavers and subsurface filtration systems for the storm water runoff on our city streets are all important environmental elements embodied in the redevelopment of Main Street," Stodola said. "The additional benefit is that these environmental systems have created a wonderful places where people want to live, work and play. Putting people back on Main Street has reenergized downtown." 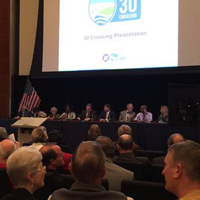 Mayor Stodola also took the class to a town hall meeting at the Clinton Presidential Center on the proposed widening of Interstate 30, an Arkansas Highway Department proposal that is a widely contested issue for the downtown community. "Our students really got an up close look at the pros and cons of expanded interstates and transportation systems and their potential impact, both negative and positive, on the redevelopment of downtown Little Rock," Stodola said. Stodola's course and career insights represent just one way Webster faculty bring a combination of professional experience and academic scholarship into the classroom. "Webster’s ability to offer applied graduate education taught by leaders in the field is unparalleled," said Carmen “Caite” Hall, Little Rock Area assistant director. "Even though field of public administration is about much more than elected officials, having two area mayors in addition to non-profit, city, state, and federal employees in the faculty is a terrific way to show the full scope and application of public administration." Hall, who took over leadership of the Little Rock Air Force Base campus location in 2014, noted that due to military locations' needs assessment process and non-compete clauses, it’s much easier to expand an existing program at a military campus than launch a new one. The collaboration with faculty and the metro location enables such growth and is paying dividends for the program in Little Rock. Plans for continued campus-to-campus collaboration on the MPA program include another class in Spring 2 taught by Virginia Hillman Young, mayor of Sherwood and herself a 2002 graduate of the program.